Hotel booking is the most fussy yet most important necessity while travelling. Itâ��s one service that not only takes care of your respite but also recharges you to quickly get into exploring another expedition. 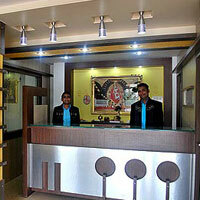 We, HOTEL SHRI SAI MURLI from Shridi takes complete care of such things and offer Hotel Booking Services. We make available comfortable 2 Star Hotels that are completely hygienic. Also, we ensure to take care of your privacy and comfort by arranging for you the best-hosting staff and services.